A myelomeningocele is a defect of the backbone (spine) and spinal cord. Before birth, the baby’s backbone, spinal cord and the structure they float in (spinal canal) do not form or close normally. A myelomeningocele is the most serious form of spina bifida. In babies with a myelomeningocele, the bones of the spine (vertebrae) don’t form properly. This lets a small sac extend through an opening in the spine. The sac is covered with a membrane. It holdscerebrospinal fluid (CSF) and tissues that protect the spinal cord (meninges). The sac may also contain portions of the spinal cord and nerves. The sac itself may be opened up either before birth or during the birth. Very soon after the baby is born, it will need surgery to fix the defect. Because part of the baby’s spinal cord area is exposed,it is at risk of getting an infection or having more damage to the spinal cord. To lessen the risk, we operate durring the first 24 to 48 hours of life. 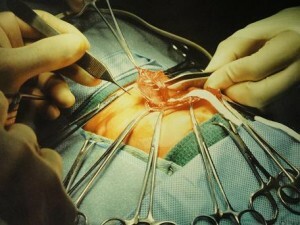 The goal of the surgery is to prevent infection and damage to the spinal cord. First, we remove the excess sac and then close the covering around the spinal cord (dura mater) so it is watertight. Then we close the muscles around the spinal cord. Finally, the skin over the open area is closed. Many babies with a myelomeningocele also have too much cerebrospinal fluid in their heads – hydrocephalus. If the baby has severe hydrocephalus at birth, it may need surgery for a temporary drainage system in the first few days after birth.